Have you ever wondered what a ring sling is? I know I did before my children came along. Having found out it’s a type of baby wrap that doesn’t use the complicated wrapping, the next step was to figure which was the best ring sling. The use of baby carriers, or babywearing, has exploded in the U.S. over the last 15 years or so. It keeps babies close while allowing mom, or dad, to get on with daily life. 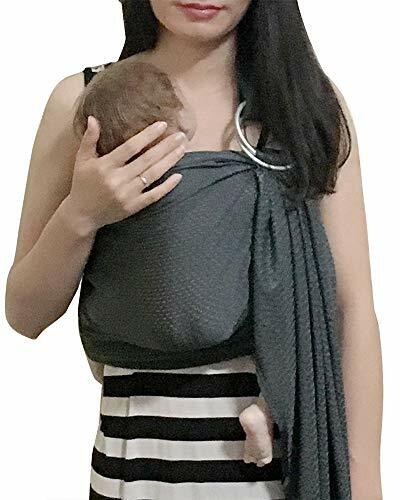 Ring slings are a popular choice of carrier because they are easy to use, lightweight, fully adjustable, and comfortable for both wearer and baby. That’s why they are often the preferred choice of baby carrier, and many parents now choose this style over others. Let’s look in closer detail at buying a ring sling, and see our top 10 choices. Use the links above to check the latest prices or read our in-depth ring slig reviews below. Why Choose a Ring Sling? The ring sling was the brainchild of Dr. Raynor Gardner. First made in 1981, it consists of a length of cloth, with two rings securely attached at one end (source). The fabric wraps around the wearer’s body and feeds back through the rings at shoulder height. Your baby is cradled in the pouch which forms at the front of the sling, keeping them close to you. Baby can feel your body warmth and hear your heartbeat. As well as being soothing for the little one, a ring sling leaves your hands free to get on with other things. Used by celebrities, like Kate Hudson and Gwen Stefani, babywearing using a ring sling has become even more popular over recent years. What makes ring slings different from other baby carriers is the flexibility. They’re almost infinitely adjustable, and can be used from birth to toddlerhood. They fit wearers of different sizes, and are easy to use — especially for little monsters who are picked up and put down a lot! They also offer sun protection and a cover for nursing, through the “tail” of excess fabric. Ring material: Sturdy aluminum, metal or nylon rings, to hold the fabric securely. Fabric material: Breathable, strong fabrics, like cotton, linen or bamboo, to keep you and baby comfortable. Rails: Padded rails (the outer edge of the width of the material), to protect little legs from rubbing or pressure. Size: Make sure the sling is long enough — many are, but some are small. Weight allowance: Check the manufacturer’s recommendations for minimum and maximum weights for the sling. Shoulder padding: This can make it more comfortable to wear for longer periods of time. There are many ones you can choose from, but here are our top picks. Comfort and privacy for you and baby when breastfeeding are paramount when you are out and about. Using one with enough fabric can give you both, so no more trying to find a quiet corner for little one to have lunch. Pura Vida ring slings are strong but lightweight, and luxuriously soft. They are made in Costa Rica from an eco-friendly blend of bamboo and linen. The fabric requires no breaking in (bonus!) and is soft, right from the get-go. There is enough material in the sling to fit from slim through to plus size moms, as it’s a whopping 7 feet long. This also means that, when breastfeeding, once your baby is latched on, you can use the tail as a privacy cover. With baby in the right position, you can even breastfeed hands-free — what a blessing for us busy moms. The naturally breathable material will help regulate baby’s temperature. This ensures they stay cool and comfortable, and it stops you from overheating too (less of the sweaty mom look). Solid aluminum rings hold the fabric securely in place, whatever carry position you use. I really like that a mom of two designs this one, and 5 percent of all profits are passed on to a charity supporting low-income families in Costa Rica. She is so confident in her product that a lifetime guarantee is offered. Made from soft, breathable fabric. Long tail makes a perfect privacy cover for breastfeeding. Aluminum rings are unwelded, so no bulky ridges. Needs tightening regularly due to the soft material. Caring for a newborn can be a testing time, especially for new moms. Keeping baby close, with a ring sling designed from a breathable fabric, will help regulate their temperature. It will also help you bond with baby, and can make them less fussy. 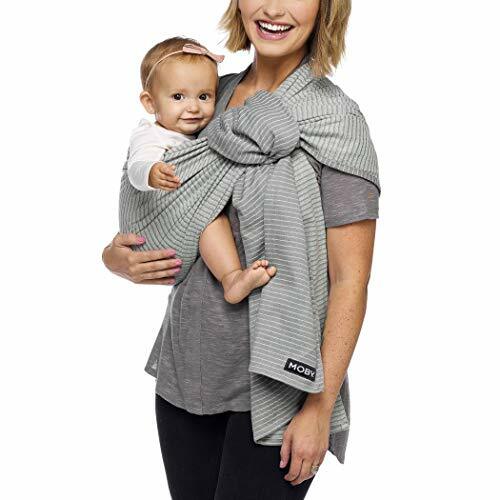 We all come in different shapes and sizes, but this ring sling from Mamaway is “one size fits all.” The dimensions are 32.5 inches wide and 85 inches long, giving plenty of room to wrap around and hold baby securely. You won’t be stuck for choice, with 17 different fabric designs, including a cool camouflage one for dads. Machine washable, 100-percent cotton, makes it cool for balmy summer days and warm when the temperature drops in the winter months. Suitable from newborn up to 36 months, the sling has been tested to hold a weight of 110 pounds over a 24-hour period. This makes it durable and sturdy. The newborn carrying position keeps baby snug and warm, using your heartbeat and body heat to make them feel safe. It’s a little like being in the womb. Subsequently, baby is less likely to be fussy and might sleep more. Breastfeeding using the sling is a breeze. Alternatively, you can use it as a cover-up or blanket. Even weight distribution means less back strain for you, and a comfortable position for babes. The rings are made from nylon, making them strong and easy to adjust the fabric through. The whole sling weighs just under 11 ounces and conveniently folds away into the patented reverse pocket. Made from 100 percent breathable cotton. Suitable from zero to toddler hero (36 months). Handy reverse pocket for storage and carrying. The rings are on the small side. There could be too much material if you are slight and short in stature. Whether you are a new mom or have other children, deciding what sling to buy can be like walking through a minefield. Having a choice of four options from one product makes this decision easier. The 4-in-1 sling has been designed with versatility in mind. It can be used as a wrap sling, a ring sling, a postpartum tummy wrap, or a nursing cover. This is ideal if you can’t make your mind up which sort of sling you would like. You could use it to support your now less-than-perfect belly in the early days, and as a sling when you are ready to babywear. The sling is made from a soft and breathable cotton blend, with 5 percent spandex, giving it a small amount of stretch. This makes it comfortable to wear for both you and your baby. The neutral gray color makes it suitable for both moms and dads to wear. It caters to babies from 8 pounds to 35 pounds; however, as it has stretch in the fabric, it is not advised for a back carry. Two sturdy metal rings make it easy to adapt this long piece of fabric into a ring sling. The company has a hassle-free returns policy and offers a lifetime guarantee on the product. Cannot be used for back carrying. Fabric may be too long for some. The warmth of your body next to your baby, combined with the heat of a summer day, can result in making you both too hot. 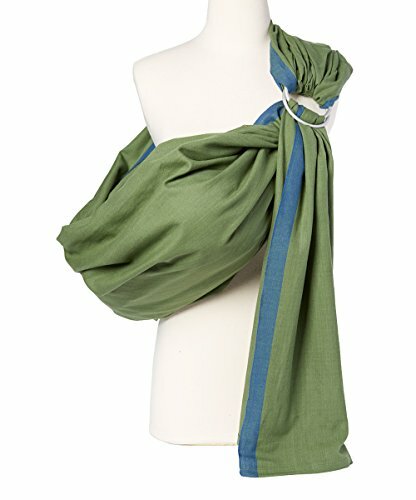 A ring sling made from cool, natural fabric will combat the steamiest conditions. 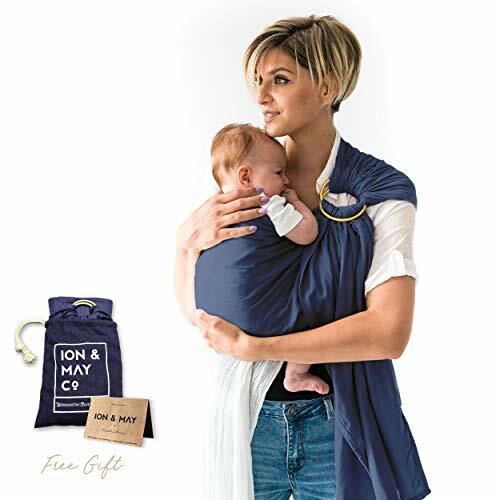 Ion & May have created this super soft baby ring sling using 70 percent natural bamboo and 30 percent cotton. Although it has three gauze-like layers, it is breathable and will keep baby cool through the hot summer months. Bamboo has antimicrobial properties which help keep you and baby fresh. Carrying a little one can be a sweaty business, but this sling has micro-gaps for moisture absorption and ventilation. The bamboo fibers lie flat so that they won’t irritate baby’s delicate skin. Available in pink, blue or gray, the fabric measures 78.7 inches long by 25 inches wide. This will fit most body types and sizes, and can support a baby weighing up to 25 pounds. The two sturdy aluminum rings let you adjust the sling with ease, while ensuring it stays in place for baby’s safety. It is supplied in its own cotton-linen pouch, making it perfect for a gift for an expectant mom. I know I would have loved to receive one of these at my baby shower. The sling is machine washable and should be dried flat. Lighter than other slings but durable. Supplied in a cotton linen pouch. Fabric doesn’t slide easily through the rings. May not provide sufficient head support for newborns. Do you want to take your little mite into the swimming pool but are afraid you might lose a grip on them? The answer could be a ring sling which will hold your baby but not the water. A light, non-absorbent fabric won’t weigh you down. Introducing your little one to the delights of a swimming pool can be a daunting experience. Maybe you have other children who you need to supervise in the pool too. This sling from Vlokup has been designed with these issues in mind — play in the shallows with your toddler while baby is safe in the sling. It is made from 100 percent polyester jersey mesh, which won’t get heavy in the water. It will also dry quickly. Available in 14 different colors, there should be one suitable for all tastes. The strong aluminum rings make the sling easy to adjust and comfortable to wear. When you have baby in the water with you, the optimal position is high on the chest. You want to be sure their head is clear of the water. The sling has a portable packing pocket and is suitable for babies weighing from 8 to 35 pounds. Designed in the U.S. and made in China, the fabric is machine washable. The sling also meets with CPSC and CPSIA standards. Remains light in water and dries quickly. As baby grows, or if you have a toddler, carrying them on your back is a useful option. Bearing in mind they now weigh more, padding can stop it from cutting in. A sling for back carrying is also an advantage when you have two children of different ages. When you venture out, you can carry your toddler on your back while your newborn is in the stroller. 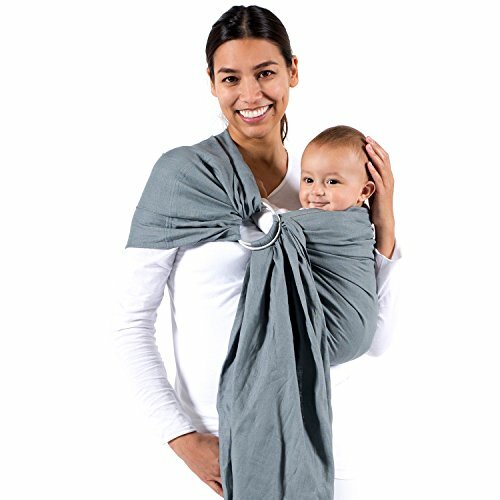 The Maya ring sling has light padding in the shoulder, which will be more comfortable when carrying your little one on your back. Created from breathable, hand-loomed cotton, the sling can support a child from 8 pounds up to 35 pounds in weight. 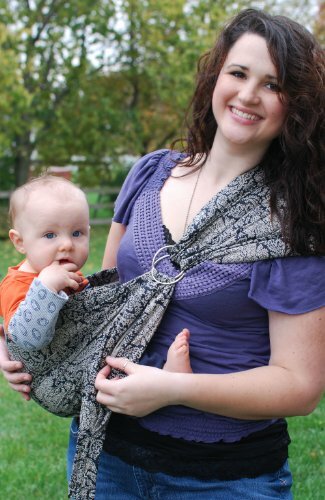 You can use this sling to carry a baby or toddler on your front or hip as well. Conveniently, this sling is available in three different sizes, from small to large. The measurements are: 67 inches, 73 inches, and 79 inches. You can choose the perfect size to suit your frame and height. If you are vertically challenged, this is a huge plus. I like the fact you will no longer be tripping over an extra long tail, or looking for somewhere to tuck it in. The sling is easily adjustable, through the strong, aircraft-grade, aluminum rings, which are tested to 250 pounds each. There is sufficient fabric to give you a privacy cover when breastfeeding a younger baby. A secure pocket built into the sling is useful for storing keys, a cell phone or even a spare diaper and wipes. That’s a bonus when you don’t want to carry a purse for a quick trip out of the home. Machine washing in cold water and line drying are advised for cleaning and freshening your sling. Padding in the shoulder for comfort. Secure pocket for carrying items. Some find the material too thick. Just because your little one is getting bigger does not mean they don’t want to feel close to you. Carrying a toddler can be tiring, but using a ring sling lightens the load. Just make sure it has sufficient fabric and can take your toddler’s weight. This product, brought to us by Hip Baby, is made from durable cotton. It is breathable for comfort and strong enough to support a child from 8 pounds up to a generous 35 pounds. Fitted with two strong aluminum rings, it’s easily adjusted for carrying tummy to tummy, on your hip, or on your back. Keep it on hand when you are out and about and little legs decide they no longer want to walk. It’s much easier having a tired toddler in a sling on your back than being carried in your arms. 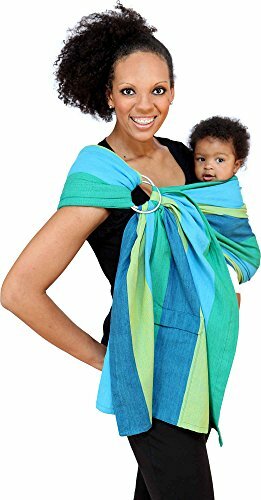 The fabric on this ring sling is 78 inches long, giving you plenty to wrap around you and your toddler. There are six attractive colors, including bright or pastel shades. Dyed in India, using non-toxic, eco-friendly products, they are fairtrade and handwoven. Lightweight but sturdy, this sling will cover your needs, from breastfeeding a little one to carrying around a toddler. I found carrying a toddler without a sling hard work. The constant wiggling would leave my shoulders feeling like I had done an hour on weights in the gym. Evenly distributing the weight with this sling will be more comfortable, especially when carrying over long periods. Cleaning your sling is easy; you can just pop it in the washing machine. Made from durable, breathable, fairtrade cotton. Suitable for babies and toddlers up to 35 pounds. Choice of bright or muted colors. Quality of the fabric can vary between colors. If you have a fussy baby who only sleeps when being carried or cuddled, this sling could be a good solution for you. A pouch holds baby’s body in the correct position and helps keep them safe and secure while they snooze, letting you get on with other things. 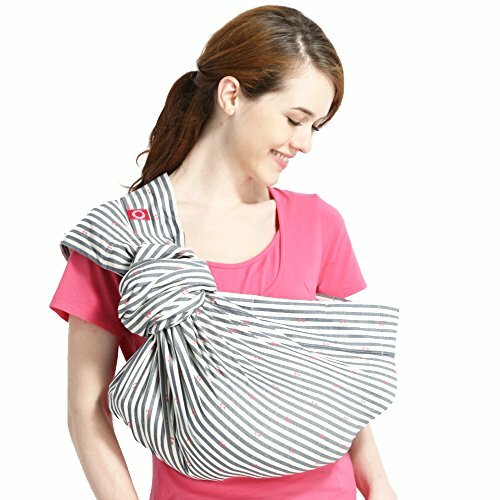 This Lite-on-Shoulder sling has a curved design, which forms a pouch for holding your baby. This provides extra support and holds baby secure, even when they are asleep. It is quick and easy to put on and adjust. A blessing when they have already snoozed off before you put them inside. Made from 100 percent cotton sateen, it has light padding in the shoulder and along the rails. This protects and cushions your little one’s delicate legs and is more comfortable for you. The buckle rings are formed from a cast copper and zinc alloy, with the bonus of no welding. Reducing the chance of weak spots means strong rings to hold the full weight of your slumbering cargo. The tail of the fabric is shaped and stitched, making adjusting the sling super easy. There are 27 colors to choose from, including patterns, plains, pastels, and bright colors. There is sure to be one which matches your clothing colors, for the fashion-conscious mom. Weighing only 10 ounces, it is lightweight and can easily be packed away in your diaper bag. The wrap measures about 65 inches and fits up to a women’s size 22. It can carry a baby up to 35 pounds. Curved pouch design for safety and comfort. Stitched tail for easy adjustment. Padded shoulder and rails, providing comfort for mom and baby. Padded rails can make it harder to adjust. Being a plus size mom, it can be difficult to find a baby carrier that suits your needs while still being comfortable. You need one long enough to hug your curves and keep baby secure. This Moby sling is made from a high-quality cotton fabric, giving it both strength and comfort. It measures 78 inches long by 27.5 inches wide. If you are a plus size mom, you will appreciate finding something that will fit snugly. It gives plenty of room for both mom and baby, even when baby gets bigger. You have a choice of three colors: black and gray fine stripe, gray and white fine stripe, or gray and blue reversible. All a bit muted, but at least Dad might wear it as well. The rings are made from lightweight aluminum, which is sturdy enough for a child weighing from 8 pounds up to 45 pounds. This means it will adjust as your baby grows. The sling is comfortable to wear for extended periods and offers many carrying options. You can use front, back, or hip carrying positions with this sling. The sling is machine washable. Good length and width, making it suitable for all sizes. Choice of colors for moms and dads. Suitable for babies up to 45 pounds. Although strong, the material may be too thick. Dads like to get close to little ones as well. However, they might not want to rock a shocking pink or multi-colored baby sling. A neutral color is more likely to encourage them to babywear. The Beco ring sling comes in two muted colors that any dad can wear: gray and ocean blue. Neutral enough to appeal to even the most conservative male babywearer. The sling measures 76 inches long and 26 inches wide, making it big enough for most men to wear with ease. Made from a strong, woven 100-percent cotton, the sling is secured with two metal rings. This lets a dad, or mom, carry baby close, whether tummy to tummy or on the hip or back. This one comes with detailed usage and safety instructions. We all know men don’t generally read instructions. Fortunately, the rails of the fabric on this sling are colored with a single line of stitching, making it easy to identify whichever side needs adjusting. The tail is also tapered and easy to pull. Easily identifiable rail for adjustment. The material is quite heavy. They are an ideal way to carry your little bundle of joy with you comfortably. However, many people give up on them before they have even started. It might take a few attempts to get it right, but once you do, you won’t look back. Wear baby high: Ensure your little one is in a position that resembles where they would be if you carry them in your arms. Their bottom should be no lower than your belly button and baby should be snug and secure. They should not be swinging in the sling — only recline an infant if you are nursing, otherwise, keep them upright. Make sure the rails are snug: The top rail should sit comfortably behind baby’s back. Younger babies’ arms should be tucked in, while older babies and toddlers might prefer to have their arms out. However, at no time should you feel your baby is leaning away from you — take up any slack by pulling the top rail through the rings. Spread the fabric through the rings: Tighten both rails individually and then spread the fabric across the rings. This will make adjustments much easier. If you pull the whole tail at the same time, the fabric can bunch up and won’t slide as easily through the rings. Spread the weight: Fanning the fabric across your shoulder and back will make babywearing more comfortable. The weight will be evenly distributed, putting less strain on your shoulders and back, which can be caused if it’s bunched up. I found that the lower it is on your back, the more comfortable it’s likely to be. Keep the bottom rail under baby’s knees: Baby’s legs should not be dangling down outside the sling. Tuck the lower rail under their bottom and up to their knees, then secure it. Once secure, fan out the material across their back, making sure there is no bunching behind the knees — bunching can cause pressure points and mark baby’s legs. Tighten the sling before placing your baby: The more you can adjust your sling before putting baby in the mix, the easier it will be. While baby may be as still as a statue before you pick them up, they will likely wriggle like a worm when you want to sling them. Make sure the main pocket has enough room to pop baby in, by leaving the top rail slightly loose. Take the weight: When you are adjusting the sling, place your hand under baby’s bottom to take the weight. Don’t try to just pull on the tail when it’s supporting the little one’s full weight. If you do, it will be hard to adjust. Wrap the tail: Once you have baby snugly in place, you can wrap the tail around the rings. This will provide a padding for baby’s head and keep excess fabric out of your way. Ring slings come with many safety warnings that, quite rightly, might leave you concerned. If it’s not worn correctly or is not maintained, then — yes — like many other baby products, there are risks. There is a risk of suffocation if the baby is not placed in the right position. I know we don’t like to think about these things, but, sadly, they do happen. Fortunately, though, suffocation instances are rare (source). Another hazard, more likely but potentially less serious, is if you fall while carrying your baby. This, of course, could happen at any time, and is actually more dangerous if baby is not securely attached to you. Just be extra careful of “wet floor” signs and pay attention to your surroundings. Don’t become distracted while talking or texting on your cell phone. If your sling comes with detailed instructions, follow them closely. If you are still unsure how to use it, request a demonstration, or ask someone to help you, until you can use the ring sling by yourself. You’ll find several helpful video links below. When wearing your baby, always ensure their chin does not rest on their chest if in a lying position. Baby should be laid flat, with a straight back. Don’t cover baby’s face with the sling — you should be able to see your baby at all times. Put the little one in a diagonal or upright position, so their back is straight and their head supported. I found that using one arm can also help keep small babies supported. Pay close attention to what you and baby are doing. To be safe, especially when they’re tiny, inspect the sling at regular intervals to make sure it’s secure and baby is comfortable. You should be able to feel if the baby changes position and the sling needs adjusting. T = Tight: A ring sling should be tight enough to let you hug baby close to you. I = In view: You should be able to see baby’s face all the time when you glance down. C = Close: Your baby should be in a position where you can kiss the top of their head at any time just by bending your own head forward. K = Keep the chin off the chest: Keeping baby’s chin off their chest is essential for a clear airway. Babies should never be curled up so much that their chin is forced toward their chest. S = Support: Baby’s back should be in a natural position and well supported at all times. Make sure their tummy and chest are next to yours (source). New to babywearing? I know I had lots of questions before I entered the world of baby slings. Here are some of the issues you might want to be addressed before choosing a ring sling for you and your baby. 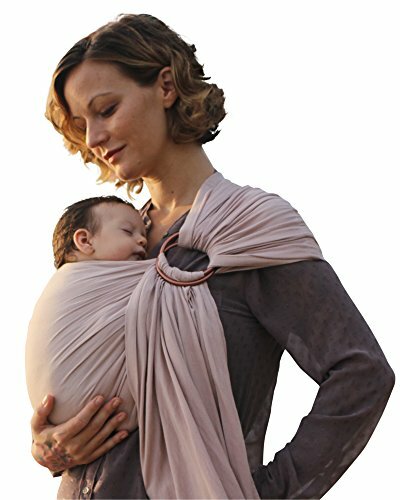 Can a Ring Sling Be Used as a Wrap? It is designed to be worn over the shoulder, whereas a wrap can be worn in many different ways. A wrap usually has more fabric for this purpose. There are some wraps that come with rings which can be converted to a ring sling, but generally — no — a ring sling cannot be worn as a wrap. Can a Baby Sleep in a Ring Sling? Yes, being close to mom or dad, securely tucked up in a sling, will often lull a baby to sleep. Just make sure they are secure and their head is supported, with their chin off their chest. Can I Use a Ring Sling on a Preemie? Most experts don’t recommend using one for a preemie. The advised minimum baby weight for most of these products is about 8 pounds and up (source). Can You Use a Ring Sling on an Airplane? Navigating an airport and sitting on an airplane with a little one can be a nightmare. A ring sling will free up your hands and means you don’t have a cumbersome baby carrier to contend with. However, during takeoff and landing, and when the “fasten seat belt” signs are on, baby must be in a lap belt. Using it at other times during a flight, for nursing, sleeping, or just keeping a little one close, is fine. Can You Use a Ring Sling After Having a C-Section? This will depend on your recovery time and your doctor’s advice. However, that being said, a sling holds baby well above your scar and therefore won’t put additional pressure on it. Using one after a C-section will allow you to feel close to your baby and help you create a bond. It could also help with breastfeeding, supporting some of the baby’s weight (source). What Is the Best Fabric for a Ring Sling? Ideally, you want fabric that is strong but breathable, and will keep baby cool in summer and warm in winter. Materials like cotton, linen, and bamboo are natural, and good for ring slings. They will also be easy to adjust through the rings, and won’t slip. Stretch fabrics are not ideal as they won’t hold baby secure enough. Fabrics like silk will slide through the rings too easily. Which Are Better: Plastic, Nylon or Aluminum Rings? Plastic rings are the most likely to become brittle and break. Therefore they are not really suitable for a ring sling. Both nylon and aluminum are strong; however, aluminum rings could have a weak spot if they have a join from welding them closed. Aesthetically, aluminum might look better, but it’s a matter of personal taste whether you prefer nylon or metal. 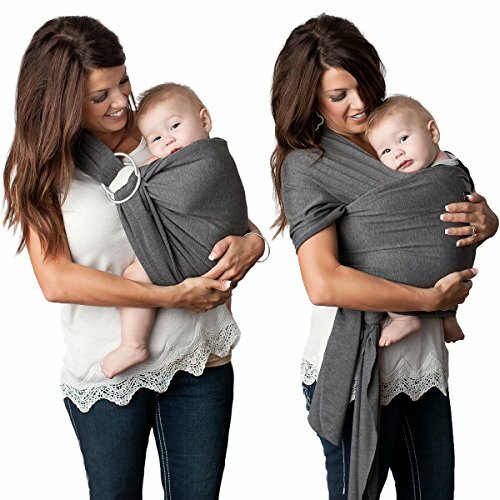 Are Ring Slings the Same as Baby Pouches? No, these two types of carrier are not the same. The baby pouch is a tubular shaped piece of fabric which fits over one shoulder and around your midsection. Baby sits in the resulting pouch that’s formed. Baby pouches are not adjustable and, therefore, not a “one size fits all” option. They are also unsuitable for carrying a little one on your back. A ring sling is adjustable and often one size. It lets you carry a small baby on your front or hip, or an older child on your back, and is much more versatile than a baby pouch. The same carrier can be worn by Mom, Dad, Grandma, Grandpa, or any other caregiver. Can You Carry Twins in a Ring Sling? Yes, you can use one for twins. However, for safety reasons, you will need two slings. You would use one over each shoulder, each holding one of your precious bundles. Ring slings are a versatile way of keeping baby close and leaving your hands free to do other things. My personal favorite is the Pura Vida luxury ring sling. Designed by a mom for other moms, the natural bamboo and linen keep both you and baby cool and comfortable. It has aluminum rings for safety and is suitable for babies and toddlers. It is long enough to fit all shapes and sizes and can be used by dads as well. I also like that it has a lifetime guarantee and the company donates part of its proceeds to charity. Whichever sling you choose, babywearing will bring you and baby closer together, and make your life easier at the same time. We hope you enjoyed our guide and we would love to hear your experiences. Please leave us a comment below. Also, don’t forget to share, so other moms and dads can benefit from the beauty of babywearing.